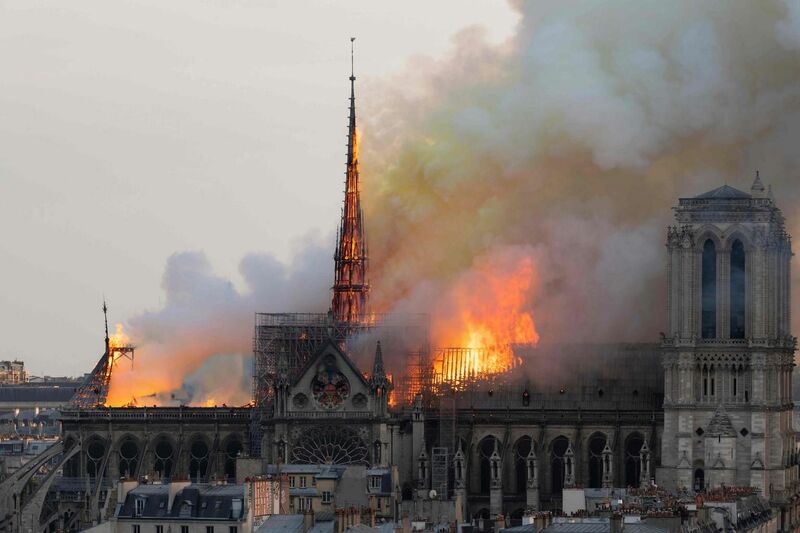 A colossal fire swept through the famed Notre-Dame Cathedral in central Paris on Monday (April 15), burning rapidly through the roof of the centuries-old Gothic landmark and causing a spire to collapse. The blaze began in the early evening and raged on for hours, as stunned Parisians and tourists watched on in horror. French President Emmanuel Macron, with tears in his eyes, vowed on Monday evening that the country will draw on "the best talent" to rebuild what the fire had destroyed. He described Notre-Dame as "the epicentre of our life" and the cathedral of "all the French". Here are seven things to know about this Unesco World Heritage site in the heart of Paris. 1. When was it built? Building started in 1163 and Notre-Dame is considered to be among the finest examples of French Gothic cathedral architecture. It was built on a small island called the Ile de la Cite, in the middle of the River Seine. Construction began during the reign of King Louis VII and took close to 200 years to complete, finishing in 1345. Notre-Dame Cathedral, whose name means Our Lady, is the seat of the archbishop of Paris. 2. What are its notable features? 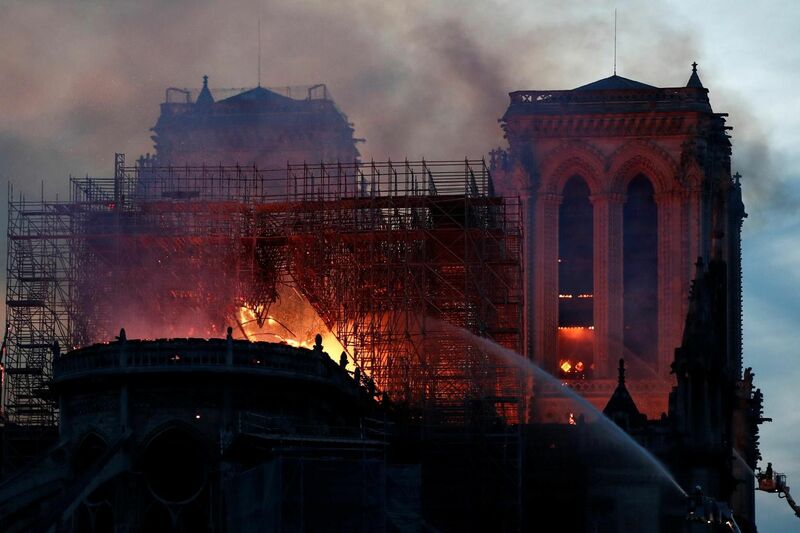 Its 100m-long roof, of which a large section was consumed in the first hour of the blaze, was one of the oldest such structures in Paris, according to the cathedral's website. Dominating the structure are its two 13th century bell towers. The largest bell goes by the name of Emmanuelle and is in the South tower. It has marked significant moments in French history, such as the end of World War II in 1945. The 387 steps up to the 69m-high bell towers take visitors past the gallery of chimeras, mythical creatures typically composed of more than one animal. 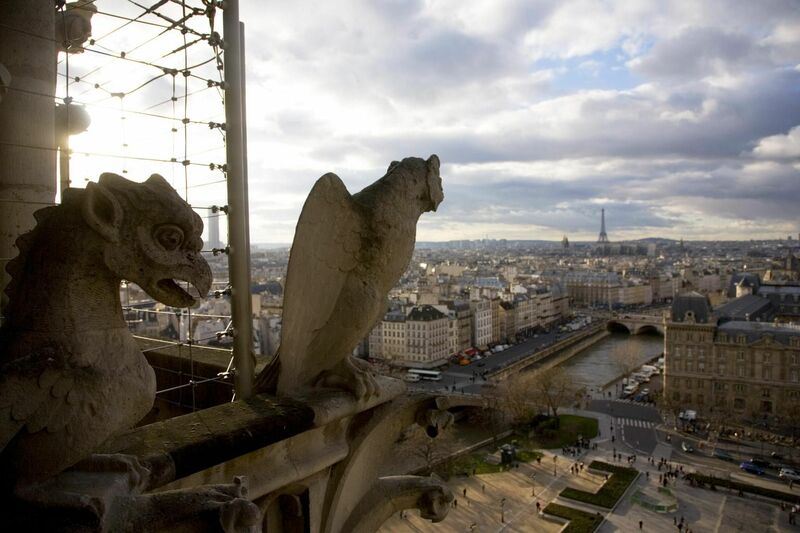 The most famous of these, the Stryge gargoyle, sits atop the cathedral watching Paris with its head resting in its hands. 3. When was its spire rebuilt? The iconic wood-and-lead spire of the Notre-Dame, which collapsed in the blaze, came down in the 1700s after it was damaged by the wind. But it was rebuilt only during major restoration works more than a century later. The cathedral had been ransacked by rioting Protestant Huguenots in the 16th century, pillaged again during the French Revolution of the 1790s, and fell into ruin due to neglect. But Victor Hugo's 1831 novel, which was published in English as The Hunchback Of Notre-Dame, revived interest in the cathedral and made readers aware of its decrepit condition. The novel tells the tale of Quasimodo, the cathedral's deformed bell ringer who becomes obsessed with the beautiful Esmeralda. Renewed interest in the cathedral led to its vast restoration campaign that began in 1844. 4. What are some of its famous artefacts? While the Notre-Dame building itself is considered by many to be a work of art, the cathedral also houses irreplaceable artefacts. At the Mausoleum of Claude-Henry d'Harcourt in the cathedral, the lieutenant-general of the king's armies, who died at age 65, is captured eternally in a white marble sculpture from 1776. In the sanctuary, there is a statue of Madonna and Child - one of 37 representations of the Virgin Mary in the Cathedral - that dates back to the 14th century, though it was moved to the cathedral only in 1818. There are paintings, such as the 1648 portrait of St Thomas Aquinas at the fountain of wisdom, and the divine Visitation from 1716. More notably, the cathedral's stained-glass Rose Windows have been touted as "one of the great masterpieces of Christianity", according to its website. The famous South Rose window, offered by King St Louis, was created in 1260. There is also its historic Great Organ, the largest in France with five keyboards, 109 stops and about 8,000 pipes, dating back to the 18th century. Firefighters so far have salvaged the centuries-old crown of thorns made from reeds and gold, and the tunic worn by St Louis, a 13th century king of France. 5. What historical events have taken place there? In 1944, General Charles De Gaulle and General Philippe Leclerc attended a mass in the church to mark Paris' liberation from the Germans. 6. What is the place used for today? Notre-Dame was inscribed as a Unesco World Heritage site in 1991 and attracts 12 million to 14 million tourists every year, or an average of 30,000 every day. Visitor numbers may sometimes swell to as many as 50,000 a day, especially during periods like Holy Week leading up to Easter in the Christian calendar. For many Parisians, the mediaeval masterpiece is a sacred space that serves as the spiritual as well as cultural heart of France. There are five masses held each day, and seven on Sundays. 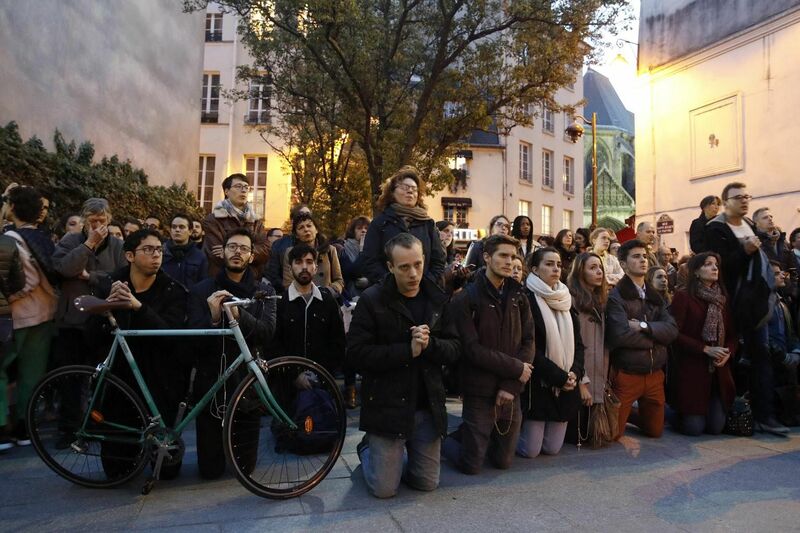 The cathedral continues to be used as a place for national mourning in modern-day France. World leaders attended memorial services held for former presidents Charles de Gaulle and Francois Mitterrand. 7. What was happening when the fire broke out? The cathedral had been undergoing extensive renovation, as weather and time had taken a toll on the building. Broken gargoyles and fallen balustrades had been replaced by plastic pipes and wooden planks. Flying buttresses had been darkened by pollution and eroded by rainwater. Pinnacles had been propped up by beams and held together with straps. In some places, limestone crumbled at a finger's touch. Just last week, 16 copper statues representing the 12 apostles and four evangelists were lifted with a crane so that the spire could be renovated.